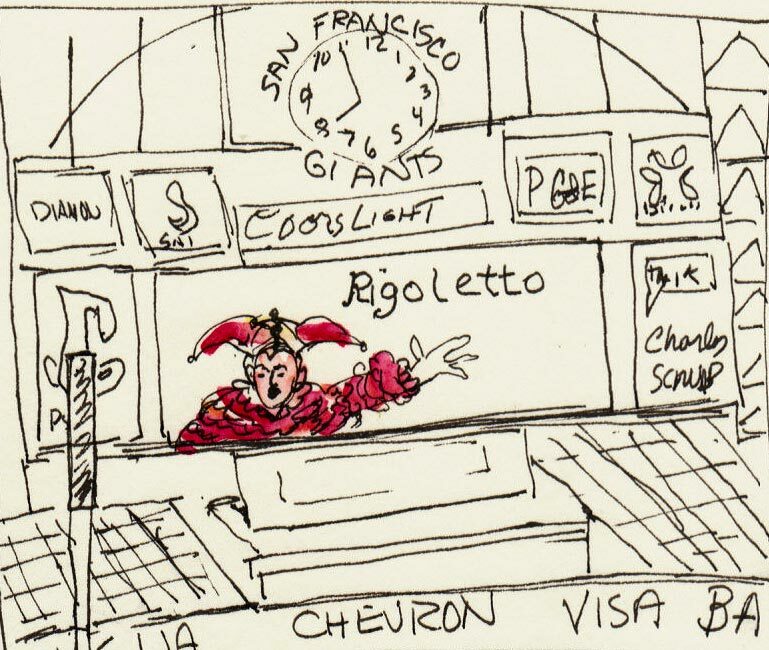 Rigoletto: SF Opera at the Ballpark, 5×8″, drawn in ink then watercolor (and a bit of digital paint) added later. NOTE: Flags at half mast for slain diplomats. Also, appalled by all the corporate advertising, I replaced their signs with generic ones. My first trip to the S.F. 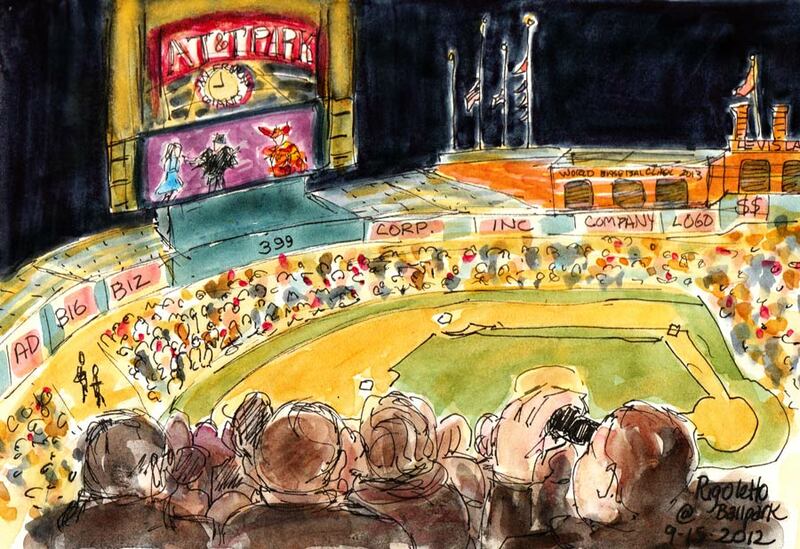 Giant’s ballpark was for a simulcast of the San Francisco Opera’s production of Rigoletto. Our plan was to sketch this annual tradition where 30,000 people attend the opera for free and picnic on the field or feast on hot dogs, beer and garlic fries in the stands. Public transit was jammed. I stood all the way to SF on the BART (the subway), then we transferred to a SF Muni streetcar so tightly packed my bag got closed in the door and my big feet barely had space to stand. Sonia got started drawing and saved our seats in the stands while Cathy and I went down to the field and started sketching around there. A woman approached me and asked, “Are you a spy? Or just a sketcher? Or an advertising executive checking on your client’s advertising?” (Nearly every inch of the park is covered in corporate advertising). I told her I was a sketcher and she did a fist pump and said, “Yay! I won $5.00!” and returned to her friends on the grass. As I continued sketching I became aware of someone standing behind me. I turned and found a TV cameraman filming me drawing. That sketch was totally crap so I hope the video doesn’t air anywhere. The sound was fantastic but it was impossible to sketch the opera because they were filming with multiple cameras and changed the point of view every 20 seconds. I’d start to draw a performer’s face and it would switch to a long shot of the stage, then to a close up. Quite different from being there and choosing what to look at. We’d been there since 6:30 and were ready to leave at halftime …er intermission at 9:00. There were so many people in line for the streetcar we couldn’t get on, so we crossed the street to wait for one going the opposite direction. We hoped by going backwards one stop we’d get a seat. After a 10 minute wait we got off to wait another 15 minutes on a cold, windy platform while a scary crazy guy screamed, stomped and threw shredded paper. We got to BART where we had another 15 minute wait for the transbay train. Then another 15 minute wait at the transfer station for the train to Berkeley. I got home at 11:30 p.m. It sounds like the ballpark is far away, but it’s only 13 miles from home. Without Bay Area traffic you could drive there in 15 minutes (like maybe around 3:00 a.m.). During the work week the trip on public transit takes an hour, not the 2 hours it took last night! I’m glad I was in the company of good friends, which made it a fun adventure. 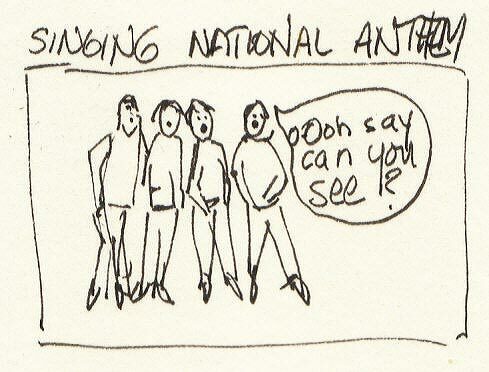 (Update: See Cathy’s sketches here on our Urban Sketchers Blog). Love the ballpark but prefer my opera at the Opera House. But the thought of Rigoletto and garlic fries is compelling!! Yikes,jana! That reminds me of being in Paris on Bastille day a few years ago, except there were several thousand more people and I was alone… Glad you had your friends with you. It’s always to read about your adventures and see your sketches. Amazing what we tolerate when we’re with good friends! looks like it was a colorful time. Glad you had a chance to go to the simulcast. I’ve been to three or four of them. They are great fun! By the way, the guys singing the Star Spangled Banner were a barbershop quartet named AfterParty. Don’t worry, their name confused me when I first heard it in an ad on KDFC radio. I thought, what? They are going to sing at an “after party” after the simulcast? At the simulcast itself, I realized that was the quartet’s name. What an adventure! I wonder what the lady would have done if you’d said spy? Great sketches Jana! Love the stadium sketch. Looks like you weren’t that far from where I sketched a few weeks back too.